Chess: The Final Frontier. If you’re ready to boldly go where no one has gone before, this Star Trek chess set may be the perfect thing for you! Haven’t you ever wanted to eat your dinner off of Captain Picard’s shiny forehead? If so, good news! 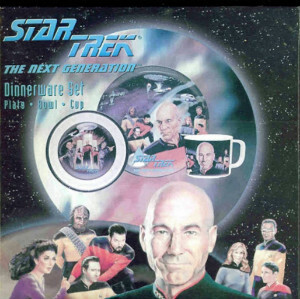 You can do just that with this dinnerware collection that includes a cup, bowl, and plate all emblazoned with the crew of the Enterprise. 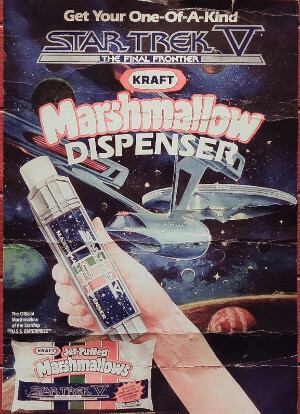 This was manufactured by Kraft in 1989 after an episode of the show featured Spock attempting to roast a marshmallow produced by his replicator device while on a camping trip. Since Kraft couldn’t quite master replication technology, they settled on a shiny plastic device that pops out marshmallows on demand. If you prefer to show off your love for Star Trek with something a bit more practical and a little less weird, why not try this sleek Star Trek chess set? This Star Trek chess set may seem intimidating to those unfamiliar with the show, but fellow Star Trek fans will recognize it immediately. 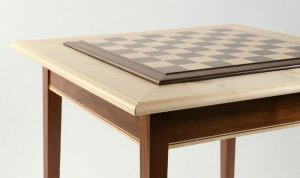 With its many movable platforms positioned at different heights, this board could easily be confused for a decorative item rather than a functional chess set. If you learn the rules of Star Trek chess though, you can enjoy many hours of play! Star Trek chess is a variant of modern chess that is played in the fictional future world depicted in the Star Trek TV shows and movies. There is a collectible rule book included with this Star Trek 3D chess set that will teach you how to play it and explain all the rules. It may look scary at first, but it’s actually quite simple. 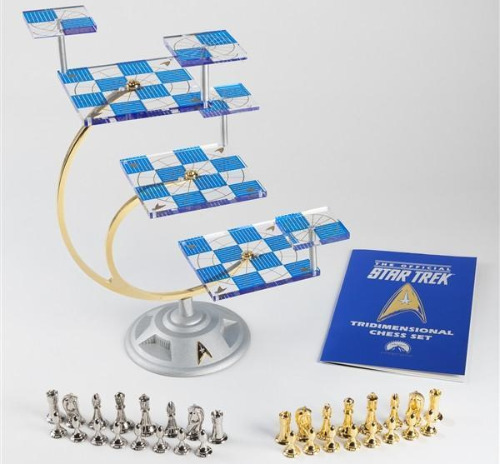 The Star Trek Chess Set makes for a very unique playing experience because it is the only chess set with board pieces that move during the course of the game. It has 3 stationary base pieces and 4 attack boards that move around during play. 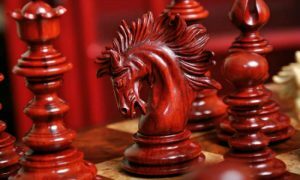 The strategy and gameplay are similar to traditional chess, but different enough to offer a new challenge. This gorgeous Star Trek chess set is made with high quality luxury materials and looks just like the one used on screen. 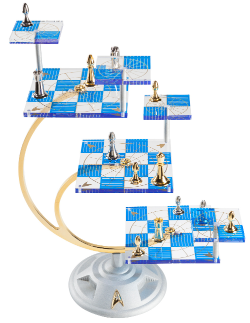 It is bold and distinctive, with translucent blue and white checkered acrylic boards floating on gold and silver supports. 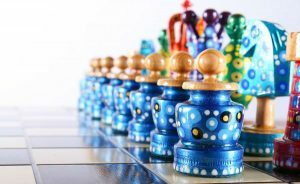 The Star Trek chess pieces are a futuristic take on the Staunton pattern, plated in sterling silver and 24 karat gold. No expense was spared on this 50th anniversary Star Trek 3D chess set. Chess in the Star Trek universe is a bit different than our modern version of chess. Fans of the show may remember characters playing a chess-like game with each other at various times over the course of the franchise’s long run. 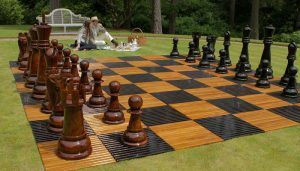 It was played not on the flat chess set we’re accustomed to today, but on a 3D board with multiple platforms at different heights. Star Trek chess or Star Trek tridimesional chess, as it was called in the show, was a favorite pastime of Captain Kirk and Spock, and it was later also enjoyed by the android Data and others. When the game was played on screen during Star Trek’s original run, it was just a prop with no gameplay rules behind it. 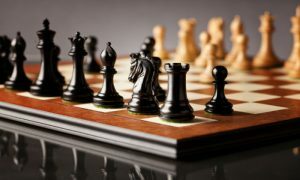 The rules were actually later developed by a Star Trek fan named Andrew Bartmess who recognized the interest people had in playing Star Trek chess. He also developed different variations of these rules to represent how Klingons, Cardassians, and Ferengi may play the game differently. We assume the Ferengi would just cheat! On each player’s turn, they may either move a movable level, or move a piece. 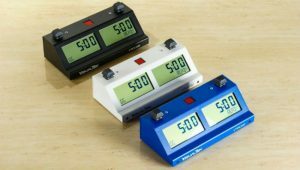 Movable levels must always be positioned above or below any corner of the 3 main boards. One square will be overlapping with the main board, with three more overhanging. 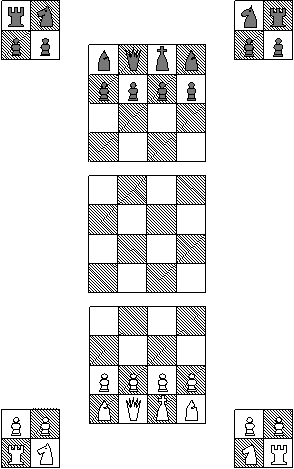 A player may move a movable level only if it is empty or if it contains one of that player’s own pawns and no other pieces of any kind. If the player chooses to move a piece rather than an attack board, the usual rules apply. You may go up or down levels as part of your move. 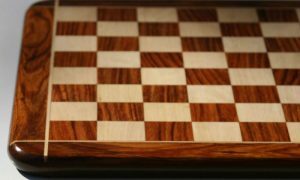 It’s helpful, when you’re first starting, to picture the Star Trek chess board as flat, like in the diagram above, to determine where your piece can move. The rule book included with The Star Trek 3D Chess Set has a more complete set of rules for you to follow. Stick to those instructions and you’ll master Star Trek chess in no time!